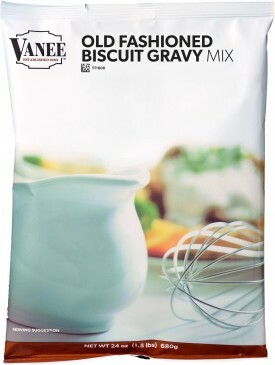 Vanee Old Fashioned Biscuit Gravy Mix is a staple of breakfast menus everywhere. Old Fashioned Gravy is the baseline for white gravies: rich and creamy, without a lot of frills. It’s perfect for smothering biscuits or breakfast skillets, and is great for using as a base to create a signature sausage gravy. Vanee Old Fashioned Biscuit Gravy Mix combines authentic flavor, texture, and appearance with superior performance, and is an easy and affordable way to quickly make large volumes of white gravy. Each 24 oz. bag makes about 62 quarter-cup servings (prepared), for a total of 372 servings per case. Gradually add one bag of gravy mix to one gallon of warm water while whisking. Bring to a boil, stirring frequently. Reduce heat and simmer 3-5 minutes, stirring briskly until thickened. Food Starch - Modified, Enriched Wheat Flour (Wheat Flour, Niacin, Reduced Iron, Thiamine Mononitrate, Riboflavin, and Folic Acid), Coconut Oil, Maltodextrin, Buttermilk Powder, Salt, Hydrolyzed Wheat Protein, Sugar, Palm and Soybean Oil, Sodium Caseinate, Yeast Extract, Mono and Diglycerides, Dipotassium Phosphate, Silicon Dioxide, Titanium Dioxide, Disodium Inosinate, Disodium Guanylate, Flavoring.